Do you know the welding process which is used for the mass production in the automobile sector? Its name is projection welding. 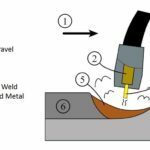 The concept behind this welding process is very easy to understand and it has a large number of applications. So, without taking more time let us start to understand this welding technique. In the projection welding, as per the name, different projections are formed for effective welding. Projection Welding is one of the types of resistance welding and its working principle is quite the same as the resistance welding. The only difference here is that projection or embossed joints are used for the welding purpose. As per the definition, different projections are formed in this welding technique. Here, the metal pieces that are to be joined are kept in between the two electrodes. A larger pressure force is applied to the electrodes. As current is passed through the system, the heat formation takes place due to the internal resistance of the metal workpieces. One point that you must note down here, is that the heat generation takes place due to the internal resistance of the metal workpieces rather than an electric arc. Those projections concentrate the heat. As the pressure applied to the electrodes increases, this projection collapses and the formation of the fused weld nugget takes place. Thus, a quality weld is formed. The exact working of the projection welding can be understood by referring the below image. You can see in the above image that the projection means the embossed joints are formed on one of the base metals and then, these base metals are kept in between the two electrodes and force is applied perpendicular to the electrodes. But as the applied force increases those sharp projections collapses and the formation of the weld takes place at the weld surface. 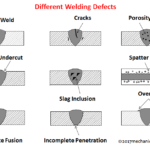 The above image illustrates the formation of the weld nuggets as well as the collapsing of the sharp projections. You may have a question that does the shape of the projections is fixed? No, you can use the projections of any shape. 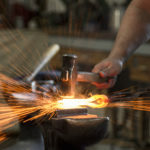 The only precaution that you must take during the selection of the projections is that they must be able to concentrate the heat to form the required weld. The most used types of projection shapes are button-type projections, cone type projections and spherical type projections. Button type projections are used for the metal sheets having higher thickness. This thickness varies in the range of the 24 to 13 gauge while the cone type projections are used for 12 to 5-gauge metal workpieces. And if you have metal sheets of more thickness than the earlier mentioned then, spherical type projection is used. A lot of manufacturers prefer the projection welding instead of other welding techniques. So, do you know the exact reason for it? Well, its answer is quite simple. In figure (b), you can see this welding technique is producing the multiple joints at the same time. 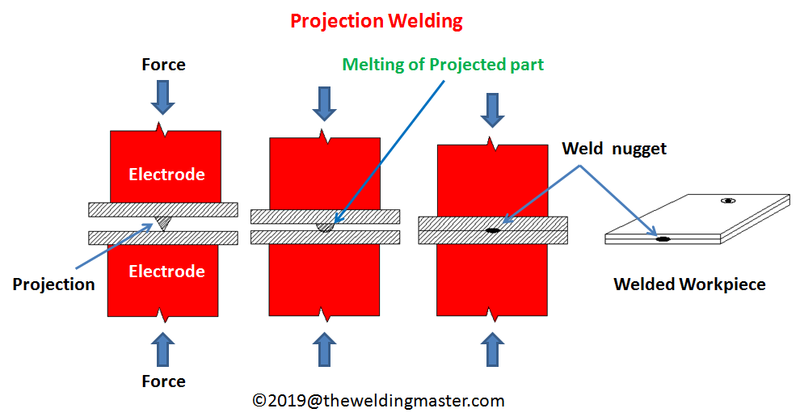 So, if you have a very less time and you want the formation of the multiple welds at the same time then, projection welding is a must for you. Therefore, a lot of manufacturers use this welding process instead of others. Another important characteristic of the projection welding is that here you get the more electrode life than the spot-welding process. So, it saves your cost of the electrodes and there is no need to change the electrodes in short intervals of time. Some of you might think, why the electrode life is longer in the projection welding than the spot welding? In the projection welding, a weld is formed as a result of the heat and the applied force. But in the case of the spot welding, a weld is formed mostly as a result of the heat generation. So, in the projection welding, electrodes are not affected by the current you are supplying. And mostly due to the force applied the required weld formation takes place. It required very less amount of current. And hence, the life of the electrode in the projection welding is much greater than the spot welding. Sometimes, plating material is present on the metal surface and this plating may result in the formation of the cracks while welding. Projection welding removes the plating material efficiently and gives a high-quality weld. Those who want to remove the irritating plating material then, go for this welding technique. As the above stated, this welding requires a very small supply of current and thus, it saves the electricity usage. So, less electricity requirement and a longer electrode life are the two most prominent benefits of this welding process. While doing spot welding there is a limitation on the thickness of the metal that has to be welded. But in this welding, almost metals of all thickness are welded. It can be used effectively for welding of the joints which are on the complicate locations. 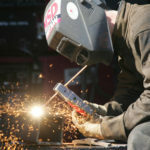 The heat balance is an important part of any welding process and this welding gives a good heat balance while welding. This welding process is not applicable for some types of the coppers and brasses. Projection formation is a quite complicated process and it takes time to form the projections. It is very difficult to form the spherical projection and a skilled person is required to form such projections. While making those projections, a height of the projection has to be maintained properly. This process is not applicable to all types of workpieces. The composition of the metal workpieces has to be considered while this process and it has some limitations. Automobile industry uses projection welding to a very large extent. 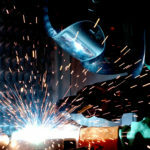 This welding process is also used for the fan covers and hollow metal doors. It is also used for producing the compressor parts and for the semi-conductors. Have you heard about the diamond segment welding? In the diamond segment welding, projection welding finds its applications. So, this is the exact working principle as well as advantages ,disadvantages and applications of the projection welding. We are sure that you get exact details of the projection welding. Share this information if you have liked it! 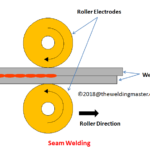 ← What is Seam Welding and How it Works?